Guys. It snowed again yesterday in New York for the THIRD time in less than two weeks. I feel like I am dying over here!! I am so over this cold weather. Doesn't March (and Daylight Savings) mean that warm weather is on the way? It feels like winter is just beginning with these current weather patterns and I. Am. Over. It. Thankfully, Pi Day is here, which means I am basically going to be eating pie all day long (before going to my pottery class). I still remember when I learned about Pi (3.14) in school and I was totally confused. As you can probably tell, math was not really my strongest subject. I preferred to focus on more subjective topics. That being said, I still love Pi because Pie. 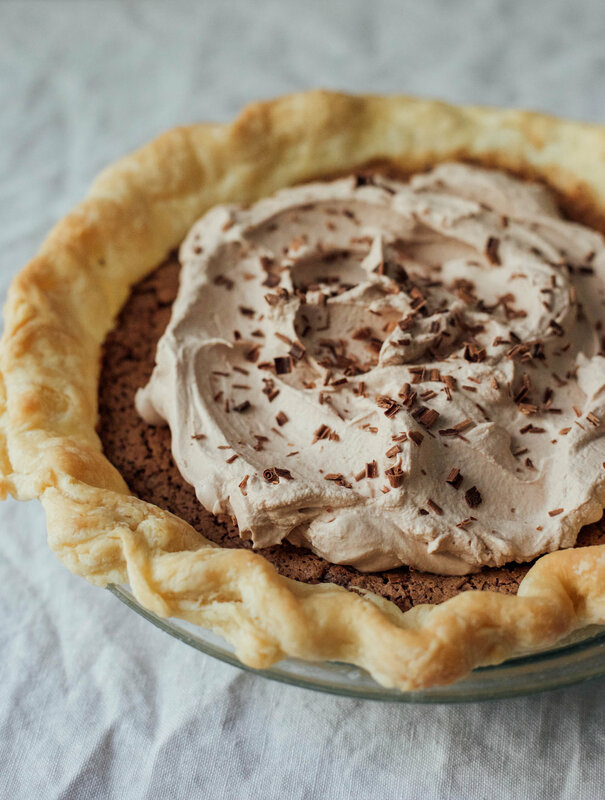 This year I decided to make an Earl Grey Chocolate Chess Pie. I've been wanting to try a chess pie for a while because I'm a fan of custardy pies and tarts, but feel like I always have problems baking them and they are either under baked or over baked. The chess pie looked like a good compromise because it seemed less sensitive, but still super dreamy looking. I loved the results and the addition of the Earl Grey really came through in a good way. 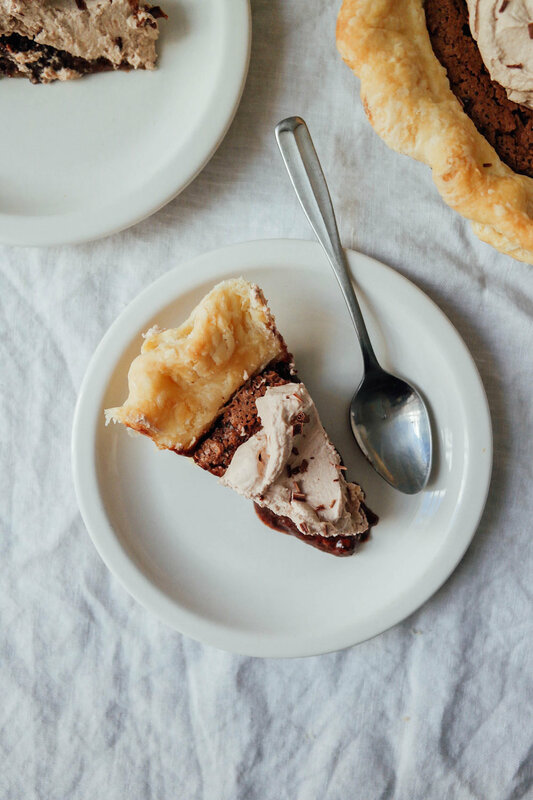 So, you'll find me eating this pie all day today, and I hope everyone is enjoying some pie too. Happy (Pi) Wednesday! Make pie dough by combining flour and cubed butter. Using a pastry blender, blend until butter is pea sized. Put the apple cider vinegar in the ice water and add to the flour and butter mixture by the tablespoon until it begins to come together. Wrap dough in plastic wrap and refrigerate for at least 2 hours. When you are ready to make the pie, preheat the oven to 350 degrees. Roll out dough and lay it into a 9-inch pie dish and crimp edges or design as desired. Trim off any excess. Put the crust in the freezer. In a large bowl, whisk together the cocoa powder, Earl Grey tea leaves, flour, sugar, and salt until combined. Add the melted butter and stir to combine until smooth. Add the eggs, evaporated milk, vanilla extract, and buttermilk and continue stirring. Pour the filling into the prepared pie crust. Bake the pie in the preheated oven for about 35-45 minutes or until the edges are set and the innermost circle of pie is still just a bit jiggly. Remove and cool to room temperature. Once cooled, prepare the whipped topping. Put all of the ingredients into a Vitamix or similar blender and pulse until stiff peaks form. Spread over the top of the pie and serve.